Home is not a physical space; it is a feeling. It is where you feel safe and guarded, so it’s natural to decorate your home as per your mood and personality. Revamping your interiors and playing around with colours is usually a go-to strategy when it comes to designing your home. However, it’s time you take your home décor to the next level with some customised DIY projects which are not only unique and quirky but are also light on your pocket. Additionally, the feeling of making something for your home is truly ecstatic. Read on for some interesting DIY projects that are guaranteed to upgrade the look and feel of your home. 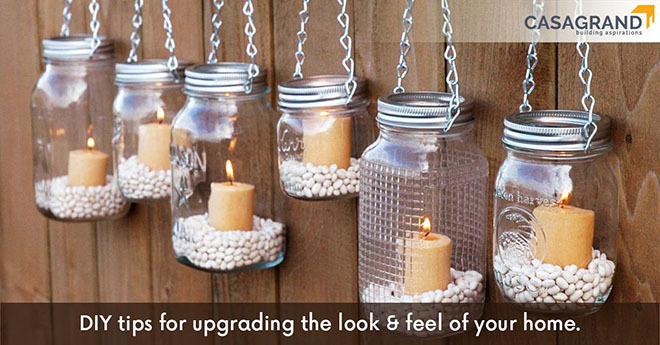 This DIY project adds a personal touch to your home. All you need is an old clock and 12 framed pictures of memorable moments with your friends and family. Hang up the 12 photo frames as per the numerical pattern of a clock. At the center, place the ticker dismantled from an old clock and Voila! Your very own family photo clock is ready! You can replace the clock handles with longer pieces of cardboard to complement the size of the clock. If 12 frames are too much, you can opt for four frames placed in the twelfth, third, sixth and ninth position, and fill up the rest of the digits with colourful dots, strips, or just leave the spaces empty for a minimalistic look. Planning to revamp your living room but do not have the budget for it? This DIY tip will add oodles of drama to your space with bursts of colour and quirk. Preserve used glass jars sold with pickles, jam and other common condiments at home for a fun DIY project. Clean the jars thoroughly and paint them with glass paints in vibrant colours and strokes. You can also coat the jars with a layer of glue and dip the wet jar in a bowl of glitter or colourful paper bits. For a dramatic effect, place jars of different shapes and sizes in a pile by your study or center table. You can use the jars as unique flower vases or add in some potpourri to make it your own customised potpourri jar. If you have glass painted the jars, you can also place tiny candles inside them to lighten up the colours and patterns. Bored of the same old blank walls? Painting your walls in bright colours is an option, but there is nothing unique about it. Instead, try revamping your dull blank wall with a pattern of 3D butterflies or flowers. All you need is basic art and craft supplies like colourful paper, a pair of scissors, glue and bundles of creativity. Cut out pretty butterfly shapes from the colourful paper and strategically stick them on your walls with their wings flapped outwards for a 3D effect. You can play with shapes, sizes and even patterns. You can also cut out some flowers and add a feminine touch to your room or place asymmetric shapes on the walls for a funky finish. A cute coffee table uplifts the entire living area and makes the ambiance light and sophisticated. Making your own coffee table that reflects your personality and style is now as easy as buying one. Gather up a set of old shutters, logs or wooden planks that can be nailed together to form a square or rectangular box-like structure which can be used as a quirky coffee table. You can also pile up the planks one over the other in a haphazard manner to ultimately create a table. Once the structure is made, you can opt for a vibrant shade of paint to add some zest to your living room or leave the sides of the table unfinished for an antique, rustic charm. Tie-and-dye is an age-old phenomenon used in India to colour and customise fabric. Bring this tried-and-tested method into your house and leave your guests spellbound. Invest in some plain white bed sheets and a dye of your choice. Tie chunks of the bed sheet with some thread and immerse the bed sheet into the diluted dye. Once dried, open up the knots of the thread and reveal your very own customized bed sheet. If bed sheets are too big, you can also try this method on napkins to serve during teatime. Home is where the heart is. DIY projects are the best way to personalise your space and make it more welcoming for family and friends. With trending kitchen design ideas and a foolproof home maintenance checklist you can revamp your interiors with minimal to no effort. If you are planning to invest in real estate, make sure you check out our extensive blog on making sure the property you buy is legally clear or gruhapravesam tips for your new home. Head out to Casagrand today and find a house you can call home.